Stepping into someone else’s shoes can be the beginning of a trip anywhere. Stepping into Dr. Phil Richardson’s shoes is a trip going everywhere. There is a minimal amount of area in the Oklahoma pork industry this man’s shoes haven’t touched. Richardson’s contribution to the pork industry has been great and the Oklahoma Pork Council is proud to call him one of our own and induct him into the okPORK Hall of Fame. At the Awards banquet during the 2013 Oklahoma Pork Congress, Richardson was presented the award by his brother, David Richardson. Richardson grew up on a diversified farm in Grady County which featured wheat, milo, sorghum, dairy cows and swine. After graduation from Pocasset High School, Richardson chose to attend college in Weatherford at Southwestern State College before moving on to Oklahoma State University to become a graduate of the OSU School of Veterinary Medicine. Upon graduation from OSU Richardson joined the US Army, where he served in both Vietnam and Oklahoma with the Veterinary Corps. Upon leaving the Army, Richardson was able to seamlessly move into a new role as a practicing veterinarian. With somewhere in the neighborhood of 200 sows on feed, the resulting finished hogs were sent to a small, local packer in Oklahoma City. As changes happened in Oklahoma, so too changes happened with the Richardson brothers’ farm. A few years after the initial 2,500 sow unit was built, an opportunity came along for the brothers to build a second 2,500 sow unit. This facility was built near David Richardson’s home in Pocasset and he focused his energy on the running of the new farm. When they finished their second barn in 1998, they built it with the new technology. At the time, they were among the largest pen gestated farms in the world. Richardson has always chosen to support the swine associations both in the state and on the national level. He began his involvement in the 1970s helping start Oklahoma’s pork Checkoff program through the Oklahoma Pork Commission. In the 1980s Richardson helped boost the National Checkoff program. He served on the okPORK Board of Directors during the early part of the 2000s, even serving a term as the president. Under his partial leadership several things important to okPORK occurred. A legal matter with the Oklahoma Department of Agriculture, Food and Forestry arose, the first piece of legislation undoing the earlier harsh regulations passed in the Oklahoma Legislature and a catering company was established by okPORK - all while Richardson was a member of the Board. Richardson’s commitment to serving the agriculture industry continued to grow and led him to run and be elected to four terms in the Oklahoma House of Representatives. During his time serving in the House Phil was able to represent the Oklahoma pork industry to a legislature which was not fond of it. As a member of the House, Phil served as chairman of the Environment and Wildlife Committee and the Agriculture and Environment Committee. His knowledge of modern hog production proved an invaluable resource for other legislators when issues related to hog farms came before the legislature. 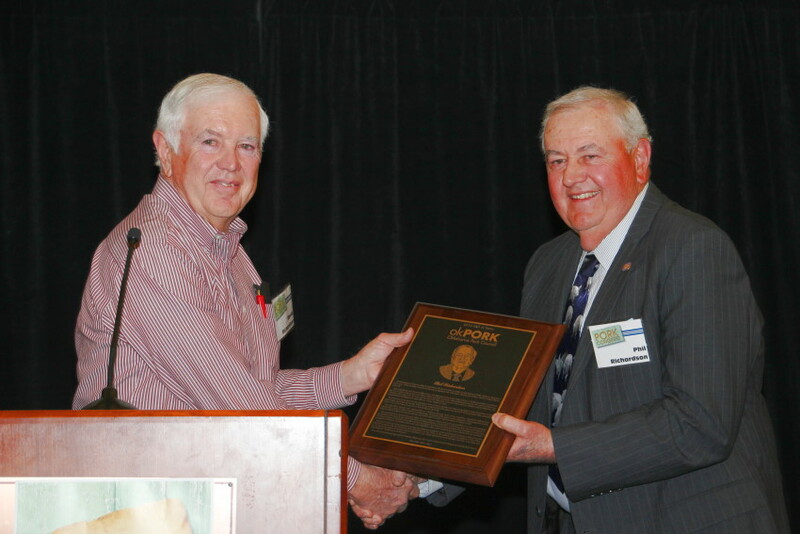 It is an honor and a pleasure for okPORK to be able to show respect to a man who has been such a large part of the pork farming industry by inducting him as the newest member of the okPORK Hall of Fame.